Crude demand is poised to increase and natural gas is undersupplied, benefiting exploration and production. Refining margins are great, benefiting refineries able to run. XLE is a basket which holds these two elements, and therefore, it's a great basket to buy. Almost exactly one month ago, I wrote an article about the Energy Select Sector SPDR Fund (XLE), in which I argued that the tide was in the process of turning for energy producers and refineries. In this piece, I will update this thesis and show that the tide has indeed turned across the sector and fundamental analysis strongly suggests the energy sector is in for a rally. As I mentioned in my last piece, the price movements of XLE largely boil down to what happens in the exploration, production, and refining sectors. 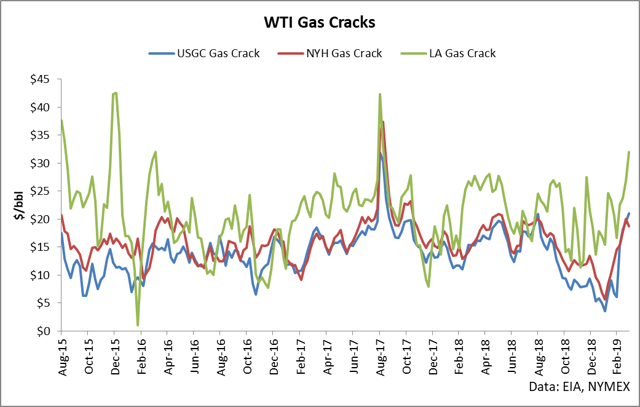 The nature of the instrument allows us to examine the fundamental balances of the major commodities (crude oil, refined products, and natural gas) to generate a holistic thesis that captures the core of what is really impacting the industry. So, let’s jump in. A wonderful place to start an analysis of a commodity is a 5-year range chart of inventories. This simple chart shows in one glance the supply and demand balance played out and compared to seasonal averages and norms, giving a concise picture of what is actually happening in the market. Up until about early March, I was bearish crude oil based on the fact that inventories were oversupplied versus its 5-year average. 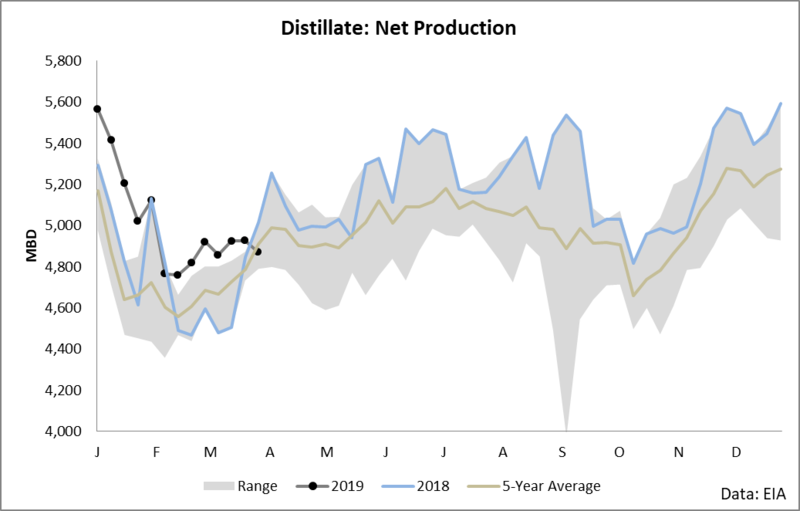 Despite strong refining runs, the market was still out of balance, with production continuing to elevate inventory levels, which told me that the market was in for a lower-for-longer situation. 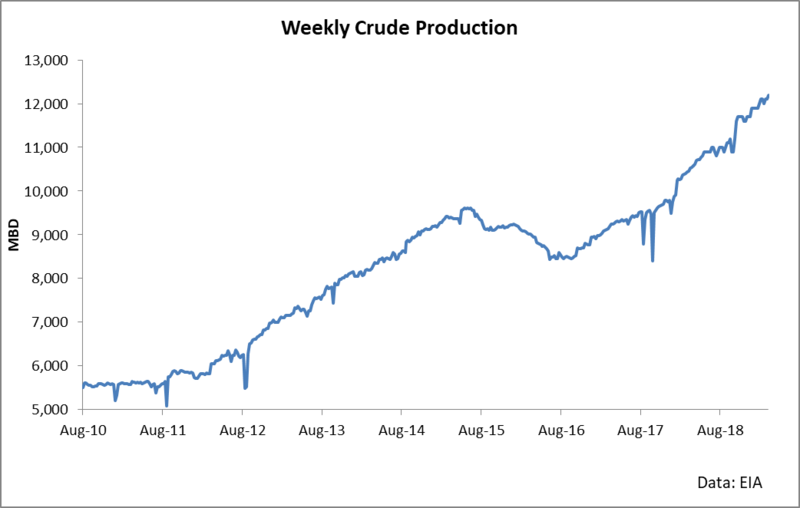 As you can see, production has remained strong and continues to climb. 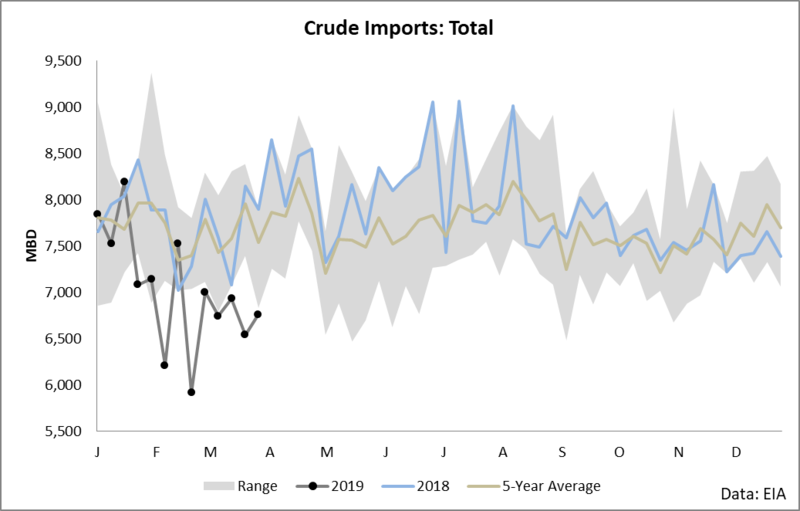 Despite incredibly strong production in which we essentially set new highs month after month, the total supply situation for the United States has been clouded in that imports have simply fallen off the face of the planet. When examined from a standard charting perspective, the trend can be seen with additional clarity - imports are hitting the lowest levels seen in several years. 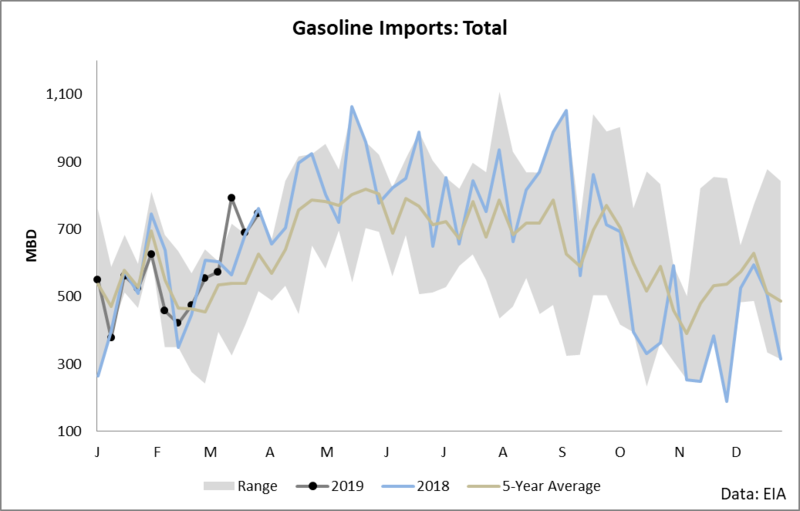 A simple analysis of the weekly import statistics shows a pretty clear culprit of what’s been driving this change in trend for the past several months. 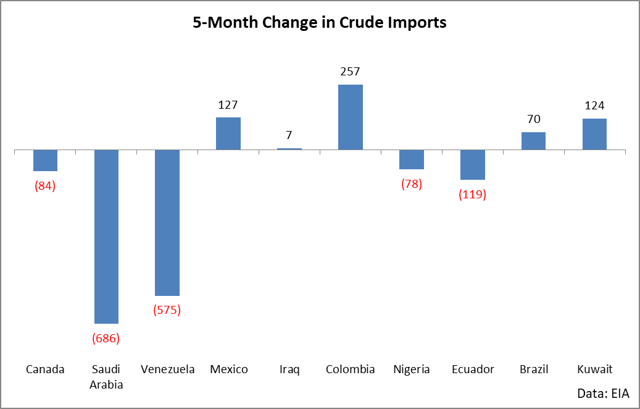 It appears that imports have been hit by the dual forces of OPEC cuts and the Venezuelan import ban. As long as OPEC cuts remain, we will likely experience a drag in imports into the United States. The potential savior here is Canada, which currently represents over half of U.S. imports. It remains to be seen where Canadian rail can clear and what the limits of its exports to the U.S. will be. 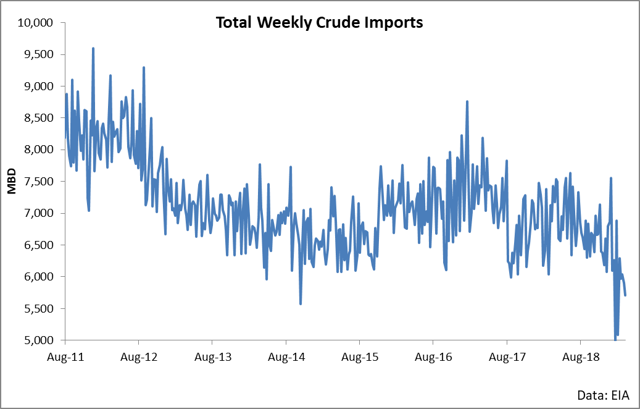 The supply side for crude is clear: production is strong, but cuts in imports are essentially offsetting the gains seen in supply. 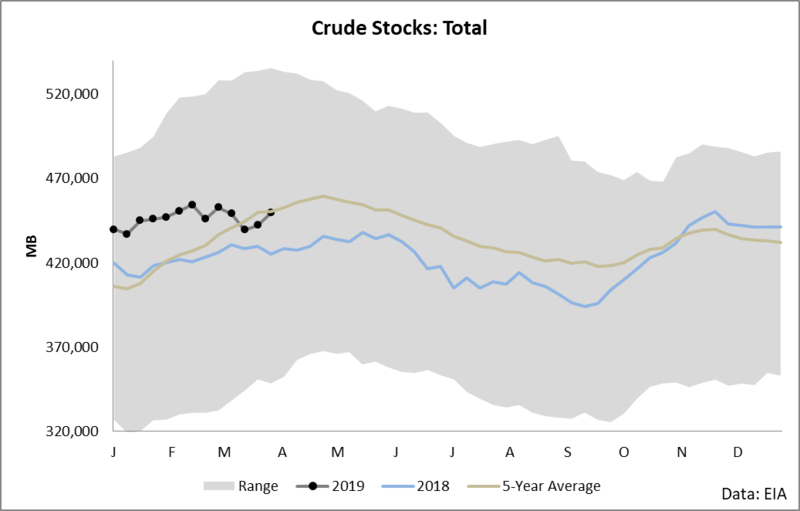 For crude oil, the demand side is poised to see rapid changes to the upside in the coming months. 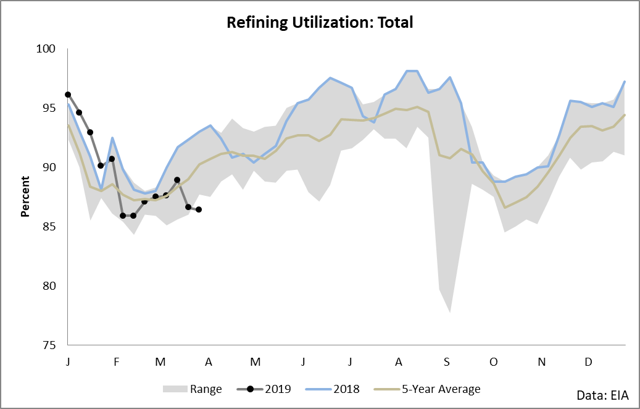 First, the year started out with incredibly strong refining runs through mid-February. As we’ll see in the products section, these runs essentially oversupplied the gasoline market when led to a collapsed gas crack and run cuts. 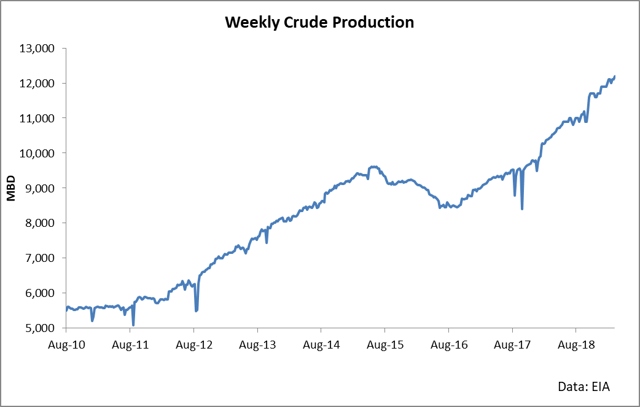 Since then, we have seen cracks recover, and we are poised for a surge in demand as refiners capture higher margins. This is bullish for crude oil. Also, on the demand side, we have exports. There’s no other way to say it: exports are strong and remain strong. As long as we see an elevated Brent-WTI spread, we are likely to see elevated exports. 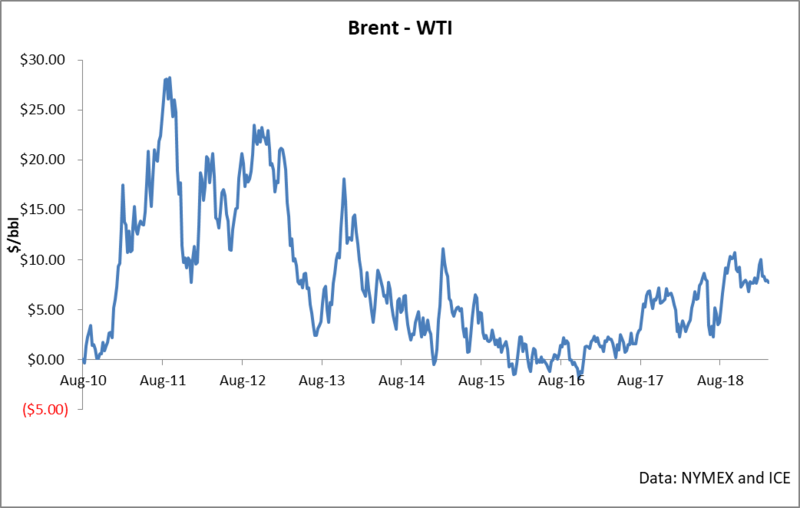 I believe this trend of an elevated Brent-WTI spread will essentially remain as long as production is strong and as long as this production remains concentrated in the shale regions. In other words, exports are liable to be a strong demand source for the foreseeable future. 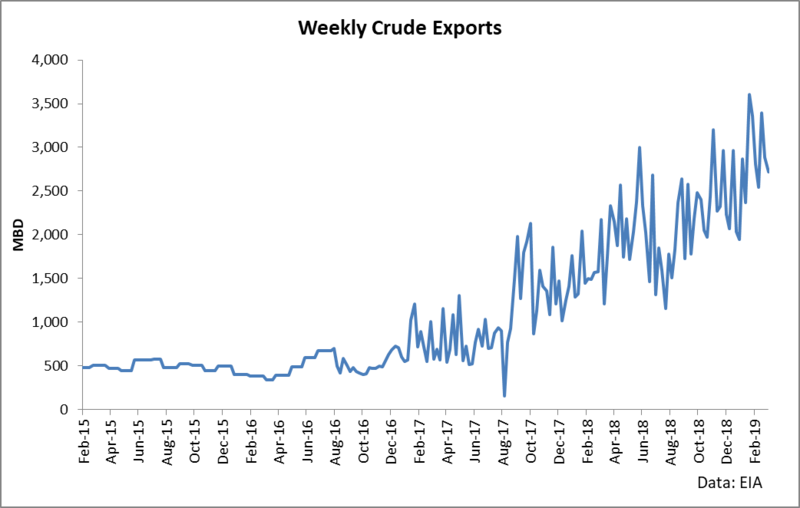 To summarize the crude picture: the supply side has seen epic gains in production, while imports have collapsed as OPEC’s cuts bite supply. The demand side is growing, and there’s an immediate catalyst for further growth. In other words, crude is bullish and the exploration and production companies in XLE will largely be exposed to this upside. 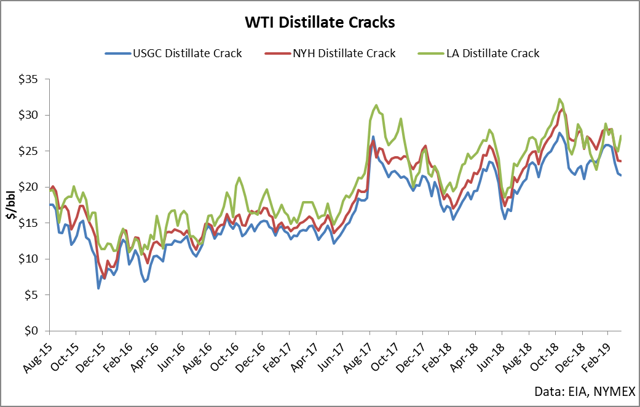 To understand the refining industry, let’s examine products by separately touching on gasoline and distillate. These two products represent around 77% of the refining yield, so an understanding of the fundamentals of these will give a good picture as to what’s happening in the refining companies which XLE holds. The gasoline market has seen a volatile year. 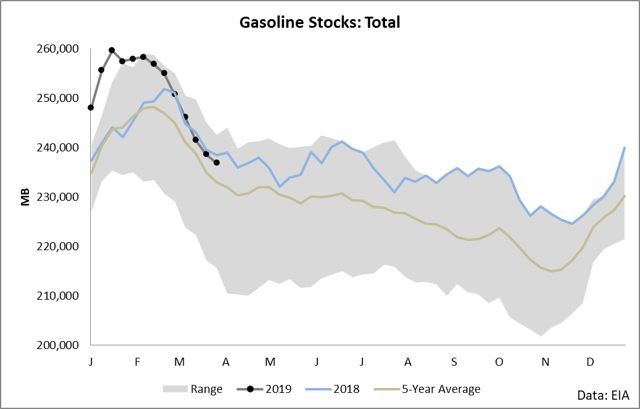 Gasoline stocks started the year with a massive oversupply, which has since reversed into a more healthy balance. ... as well as very strong imports. ... but the clear culprit here is demand. Demand is strong and good. 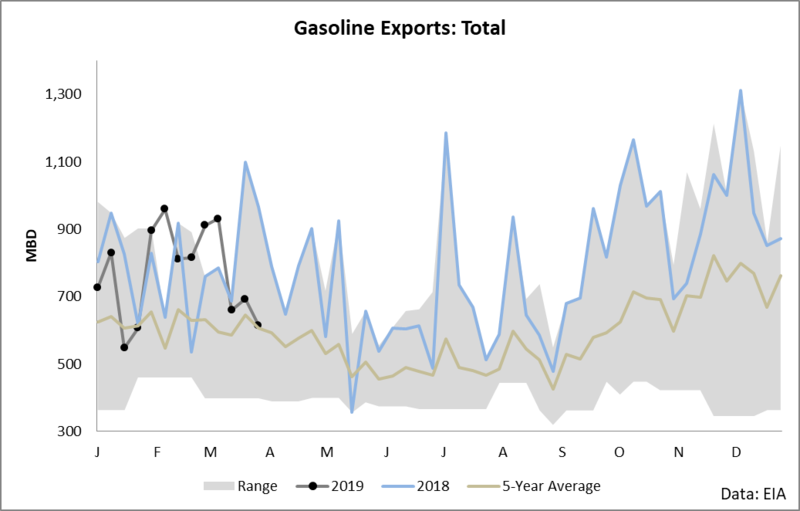 This demand for gasoline is reflected in the regional gas cracks which have rallied to very strong levels. The gasoline picture is pretty clear - what started as a bad year has switched to be a good time to be a refinery. For the holders of XLE, this means that in the immediate future, refineries are poised to benefit. The distillate equation is a little more straightforward than gasoline in this - it’s been good to refine it for a long time. ... natural demand remains strong. This demand can be seen in the distillate cracks, which are very good and signal further demand. To recap the refining sector, we can point to the fundamentals of both gasoline and distillate and say, “It’s time to buy refineries”. For holders of XLE, this is a clear benefit for the refining exposure. I’m running out of space to do an in-depth fundamental dive on natural gas similar to how we’ve handled crude, gasoline, and distillate. However, we can say a few key things about it from the balance picture. 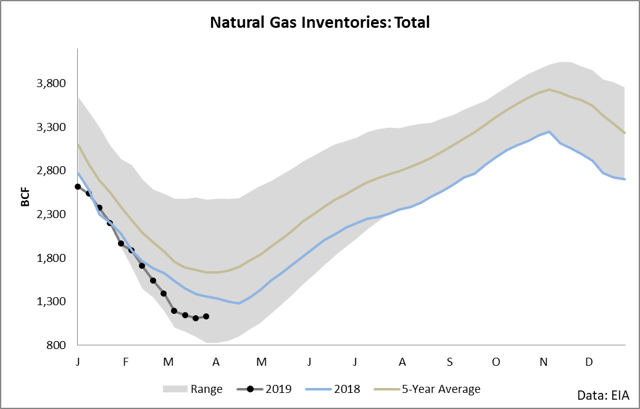 When it comes to natural gas, the market is entering resupply season as winter fades and demand is reduced. The outright level at which we are entering the period of resupply is very low - indeed, it’s near the bottom of 5-year range, with several weeks this year flirting with or setting the level. My expectation is that we will see a standard resupply period in which we remain near the bottom of the 5-year range. The key derailing factors here would be either additional cold which fuels a few more weeks of demand or a hot summer which drives power burn. Either of these factors can impact the market in either direction. It’s my belief that given the uncertain future and the impossibility of calling the weather several months in the future, taking the average build / draw is the correct approach for the duration of the year. Given this strategy, we would certainly be bullish natural gas, but with an eye on the weather (as always) to see if any short-term developments can throw off this analysis. If you’ve stayed with me this long, I congratulate you - we’ve covered a lot of territory. Here’s my final recap as it impacts the constituents of XLE. 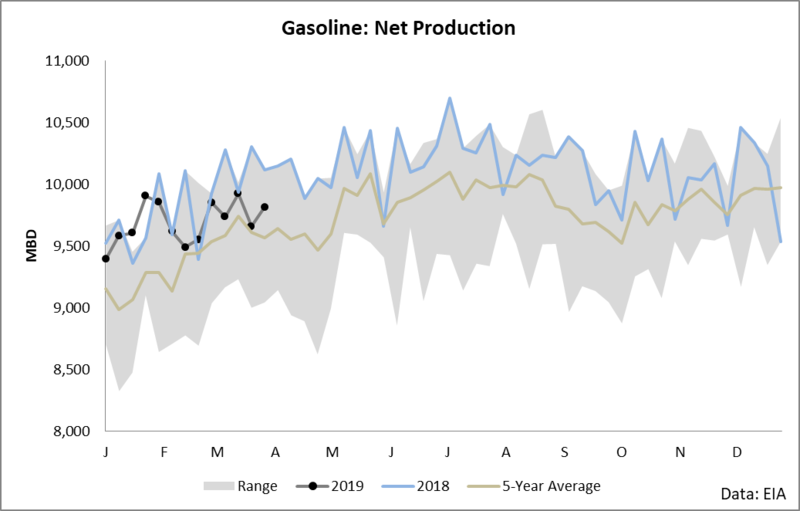 Exploration and production: Crude is bullish, as demand is poised for a surge in the immediate future and total supply (production and imports) is largely holding steady. Natural gas is bullish, and if we have a “normal” year, we’ll remain bullish through the end of the year. Refining: Gasoline is bullish in that it’s seen very strong draws and cracks have surged to multi-year highs. 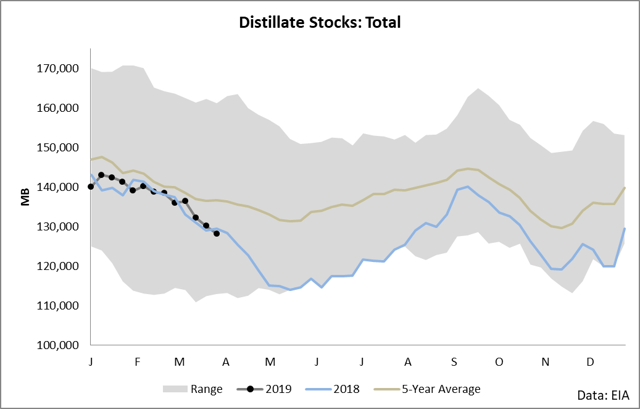 Distillate is bullish in that demand has been unabated and stocks continue to draw and be weak. In light of the bullish factors impacting both E&P and refineries, buying XLE makes for an excellent trade, I believe. In terms of holding horizon, I’d suggest that a conservative window for this specific analysis is until driving season is in full sway and we can assess the supply and demand equations with more clarity.